Local Florida wine: Should Keel and Curley Winery be the road less traveled? 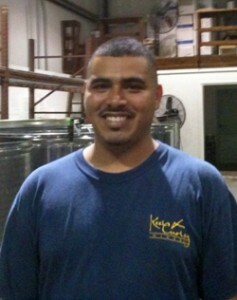 I will begrudgingly admit skepticism before I visited Tampa’s local Plant City winery, Keel and Curley. It took me three years to accept the invite. Some colleagues in the wine business, who shall remain unnamed, scoffed and giggled, asking, “Blueberry wine…Really?” Despite their wine snobbish snubs, I reserved judgment and embarked on the long overdue trek to this charming Little Winery That Could. Joe Keel started his namesake winery in 2003 when the market for fresh blueberries tanked. His family had been in the blueberry growing business for years but Joe wanted to find a permanent solution for bumper crop years. It bothered him so much he turned not to jams or pies, but to wine. His first batch of blueberry wine — concocted in his kitchen — turned out “so-so”, but Joe improved it over time with the help of a blueberry winemaker from Vermont. Once perfected, he hit the road, doling out samples of his vitamin-rich, alternative grog to whoever would try it. Then, during a tasting in Key West, Publix executives discovered it. You know, that tiny grocery store chain in Lakeland, Florida? Joe hit paydirt. In 2007, Keel and Curley landed on the map and in Publix stores across the state. Now, this “little” winery produces 20,000 cases of wine per year. And it’s pretty darn popular. The Saturday I visited, the tasting room hosted a continuous stream of enthusiasts sniffing, sipping and spending plenty to carry home a bottling of local wine country. Meanwhile, outside on the expansive, tent-covered deck, the catering staff was setting up for a wedding, which apparently occur often. For those who want even more of an authentic winery experience, Keel and Curley Winery hosts concerts and tours of the 25 acres of pesticide-free blueberry bushes, perched on a Disney-esque, tractor-pulled trolley. Sound cheesy? Hell yea, but there’s nothing wrong with that. A little down-home kitsch pairs well with this local wine. Jim Moody, their super friendly, down-to-earth marketing and sales director, holds a deep affection for the winery started by his friend Joe Keel (The “Curley” part is an homage to Joe’s mother). He remains undaunted by the people who snub their products, laughing when they sneeringly label them “fruit wine.” “Aren’t grapes fruit, too?” Moody asks while rolling his eyes. 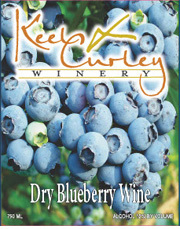 Blueberry wine production is similar to grape, but Keel and Curley can make wine year-round by freezing fresh fruit and thawing when needed. It takes winemaker Oscar Mendez about 45 days to craft a batch, using a little over a pound of blueberries per bottle and finishing it with a French oak chip soak to gain flavor depth like many grape wineries do. The little touches work — production has expanded so quickly, they have to buy blueberries from all over the state. But wait, there’s more than just blueberry. A few years ago, they expanded their offerings to include “Fusion” wines, which marry 80 percent grape wine with 20 percent fruit concentrates like strawberry, key lime, and wild berry. I tasted through the entire 10 bottle offering at Keel and Curley, with mixed reviews. First of all, you gotta enjoy sweetness in your wine, as even the “dry” blueberry contains enough sugar to give you a hefty high. They generally run about 12 percent alcohol and are quite perfect for a hot summer day, over ice even (you might as well embrace it, right?). I preferred the blueberry wines over the grape fusion, as some had an off-putting chemical aftertaste but I’d recommend everyone at least try the wines, no matter how cabernet-centric you might be — it’s terribly important to support local businesses, especially now. And it’s a really a cool place… the closest thing to a California winery experience I’ve had in Florida (Lakeridge Winery in Clermont comes close, but it feels a little more like I’m being herded. Mooo.). Semi Dry Blueberry: Not just blueberry but blackberry flavors. All fruit, would be good in sangria. Sweetness= 5. Sweet Blueberry: Most definitely a dessert wine. Think grape Starburst candy with a strawberry finish. Sweetness= 8. Wild Berry Pinot Noir fusion: Moody calls this their “man’s wine” since it tastes a little bolder. Blackberry, grape Jolly Rancher, hint of oak. Sweetness= 4. Strawberry Riesling fusion: My favorite of the grape-based fusion wines and also one of their biggest sellers. Intense strawberry flavor, like a scented strawberry Yankee Candle. Dangerously tasty with a peach finish. Sweet, but not cloying. Serve super chilled. Sweetness= 4. Key West Key Lime: Had a bit of an artificial aftertaste but I liked the bright lime margarita flavor. 80 percent sauvignon blanc. Not overly tart or acidic, like a well-balanced lemonade, only with alcohol. Sweetness = 3. All the wines range from $11.99 to $14.99 and can be shipped to other states (where the law allows). If you live in Tampa Bay, Keel and Curley hosts happy hours every Friday night which feature live music, free food and 2-for-1 wine and beer. Details on their website. 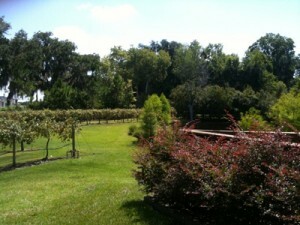 4 comments to Local Florida wine: Should Keel and Curley Winery be the road less traveled? tried the semi-sweet blueberry at a tasting in a local publix a few months back. was awesome, but a little sweet for my taste. i’ve been tring to find the dry version for weeks, but have been unsuccessful. even the publix’s don’t seem to carry it. ARRRRRGGGGHHHH!!!!! This is for Ken Healy, if you ready this, The Publix by me sells the dry version but it is in Orlando, Fl. So if you are close to that area, you might find it, if not, good luck =) I tend to enjoy the sweeter wines more but my favorite is the strawberry riesling. I also very much enjoy the sweet blueberry. I will admit that I am afraid to try the Key Lime because, I can’t see myself being as forgiving for the artificial flavor I’m expecting to taste. Ask your Publix to order it, they will!